The Hindi dubbed version of Suriya's blockbuster Singam 2, titled Main Hoon Surya Singham 2, will be released on August 2, according to an official update from Prabhu of Studio Green. The Hindi dubbed version was initially slated to release a few weeks post the Tamil version's release on July 5, but there has been an unavoidable delay. Ajay Devgn and Rohit Shetty are also planning to make a sequel to their Singham, which was the official remake of Suriya's earlier Singam. Their sequel will have a different story line. 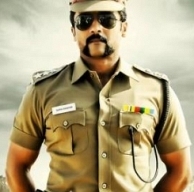 We have to see if Suriya can make a mark as Duraisingam in Bollywood too. With monstrous biggies such as SRK's Chennai Express and Akshay Kumar's Once Upon A Time in Mumbai Dobaara, set for release in the ensuing weeks of August, the competition will be really tight for Suriya.